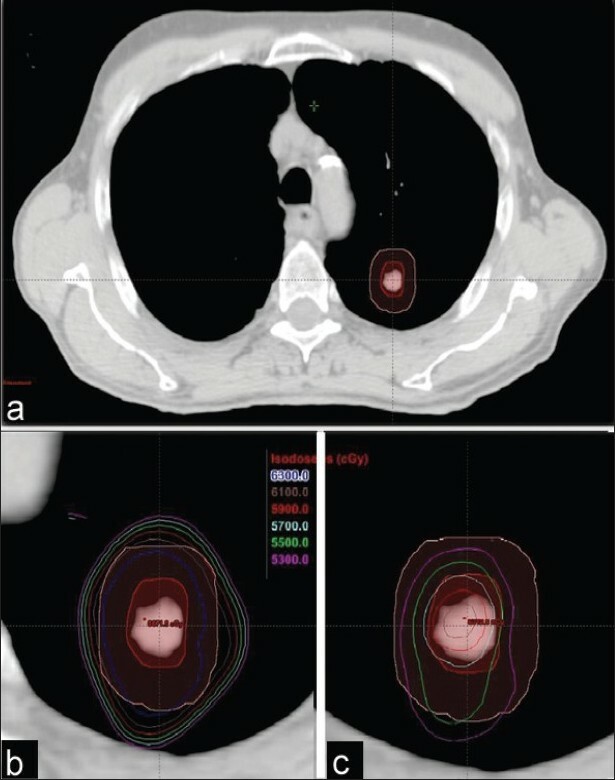 The aim of this study was to evaluate differences in dose distributions in stereotactic body radiation therapy treatment plans for lung tumors calculated with pencil beam convolution (PBC) algorithm with modified Batho power law (MBPL) versus heterogeneity corrected anisotropic analytical algorithm (AAA) of the Varian Eclipse treatment planning system. The four-dimensional computed tomography images from 20 patients with lung cancer were used to create treatment plans. Plans used five to seven nonopposing coplanar 6 MV beams. Plans generated with the PBC algorithm and MBPL for tissue heterogeneity corrections were optimized to deliver 60 Gy in three fractions to at least 95% of the planned target volume, and the normal tissue doses for spinal cord, esophagus, heart, and ipsilateral bronchus were restricted to less than 18, 27, 30, and 30 Gy, respectively. Plans were recalculated with AAA, retaining identical beam arrangements, photon beam fluences, and monitor units. The pencil beam plans, designed to deliver 60 Gy, delivered on average 51.6 Gy when re-calculated with the AAA, suggesting a reduction of at least 10% to prescription dose is appropriate when calculating with the AAA. We performed this retrospective study looking at patients treated with PBC modified batho power law (MBPL) dose calculation algorithm in our institution. We are currently introducing AAA treatment planning in our clinic. The purpose of this study has been to judge the effect the choice of calculation algorithm (PBC or AAA) has on dose distribution and how this choice might affect patient treatment planning in terms of prescribing equivalent doses. The subjects of this retrospective study were 20 patients with non-small cell lung cancer (NSCLC) treated with SBRT in the department of radiation oncology at our institution. The average age of this group of patients was 71.5 years (range, 58-85 years). All the patients were allowed to breathe freely, and the full breathing cycle was divided into ten phases. The real time position management (RPM) respiratory gating system version 1.6.5 (Varian Medical Systems, Palo Alto, CA) was employed during the CT scanning (GE LightSpeed CT Scanner) to create the 4D CT images that were sorted and transferred to the planning software using the GE Advantage Workstation aw4.3_06. The algorithms used for treatment planning were version 8.6.15 from Eclipse External Beam Treatment Planning (Varian Medical Systems, Palo Alto, CA). The plans used five to seven fields of non-opposing coplanar 6 MV beams. The ITVs were delineated based on the average of all ten 4D CT images acquired during the full breathing cycle and given an extended margin of 0.7 cm to create the planning target volumes (PTVs). The plans were first generated with PBC utilizing MBPL for tissue heterogeneity correction and optimized to deliver a prescribed dose of 60 Gy in three fractions to at least 95% of the PTV, keeping the normal tissue doses for spinal cord, esophagus, heart, and ipsilateral bronchus limited to not more than 18, 27, 30, and 30 Gy, respectively, as recommended in RTOG 0236. For the normal lung, the percentage volume receiving 20 Gy or more, V20Gy , was restricted to 10%, unless this proved unworkable, in which case up to 15% was acceptable. Because radiation pneumonitis is volume- and dose-dependent, dose volume parameters such as V10 Gy (V10 ), V20 Gy (V20 ), and V30 Gy (V30 ) representing the percent volumes of uninvolved lung tissue receiving doses above 10, 20 and 30 Gy, respectively, mean and maximum lung doses (MLD and MaxLD) were calculated to better quantify this relationship. The calculation grid resolution applied in the treatment planning software was 2.5 mm. The previously optimized treatment plans  were then re-calculated with AAA using identical beam arrangements, photon beam fluences, and monitor units. The plans calculated with PBC MBPL were used as the standard for the purpose of comparisons and the percent differences in values were calculated. 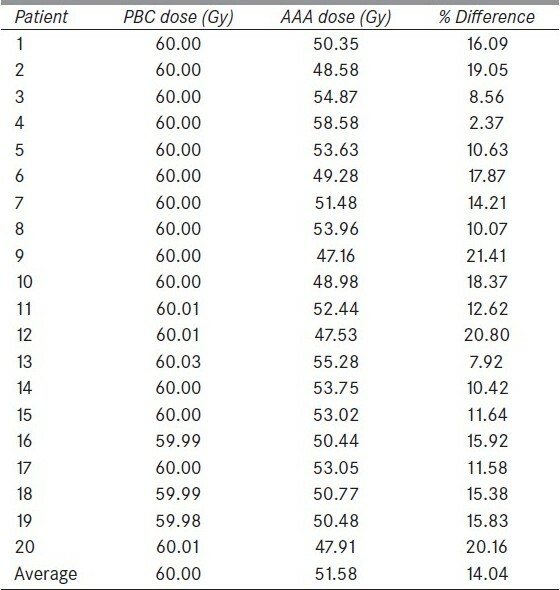 The minimum, maximum, and mean doses to the PTV calculated using PBC and AAA for all 20 patients are shown in [Table 1]. The AAA plans had significantly lower average minimum, mean, and maximum PTV doses by 16.6%, 8.2% and 2.1%, respectively, compared to those with PBC plans. Transversal CT images of a typical patient are shown in [Figure 1]. 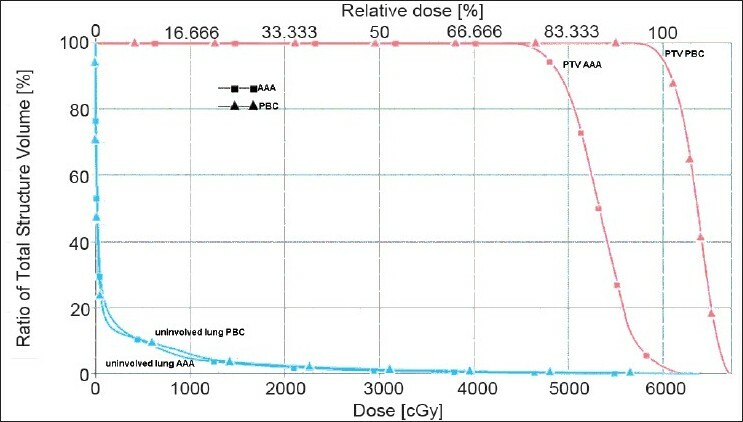 [Figure 1](a) shows the ITV and PTV contours of a typical NSCLC patient, [Figure 1](b) shows isodose distributions ranging from 53 Gy to 63 Gy in increments of 2 Gy calculated with PBC, and [Figure 1](c) shows the same range of isodoses calculated with AAA. The dose volume histograms (DVHs) for PBC and AAA corresponding to this patient are shown in [Figure 2]. 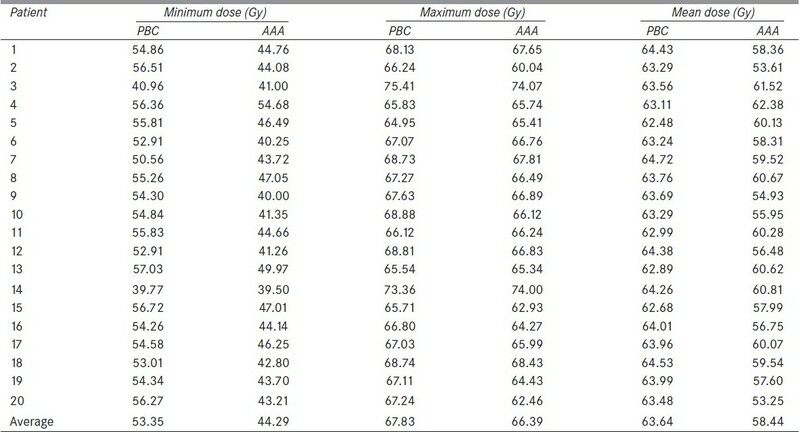 Doses to the 95% of PTV (D 95 ) calculated using PBC and AAA for all 20 patients are shown in [Table 2]. The average dose to D 95 calculated for the entire patient group with AAA was significantly lower by about 14% compared to that with PBC. The average MLD, average MaxLD, V10 Gy , V20 Gy , and V30 Gy from all 20 patients are shown in [Table 3]. The AAA plans also had lower average mean and maximum doses to the uninvolved lung by 8.6% and 8.9%, respectively. Also, the average V10 , V20 , and V30 were below 10.2%, 5.2%, and 3.0% for both PBC and AAA plans, with AAA resulting in less calculated dose to the uninvolved lung. The RTOG 0236 protocol required that 95% of PTV be conformally covered by 60 Gy delivered in three fractions with no heterogeneity corrections applied. Xiao et al.,  reported on the recalculation of a subset of 20 treatment plans from RTOG 0236 with heterogeneity corrections using the superposition-convolution algorithm. They found that the average dose delivered to 95% of the PTV with no heterogeneity correction was 60.6 Gy, whereas with heterogeneity correction the average value dropped to 55.9 Gy. The authors advocated adjustment of the prescribed dose for future SBRT protocols that use accurate heterogeneity corrections. A prescribed dose of 18-19 Gy per fraction for three fractions, instead of 20 Gy per fraction for three fractions used in the RTOG 0236 protocol was recommended. In our study, the average dose to 95% of the PTV recalculated with AAA was 51.6 Gy for our group of 20 patients, whereas it was 60 Gy calculated with PBC (MBPL). Our work clearly suggests a prescription dose reduction of at least 10% (54 Gy instead of 60 Gy in three fractions) or even up to 14% (51.6 Gy instead of 60 Gy) when calculating dose with AAA instead of PBC with MBPL heterogeneity corrections. Fragoso et al. also observed a marked reduction in calculated dose to the PTV when PBC-based plans were recalculated with the Monte Carlo (MC) based algorithm. The minimum PTV doses shown with the PBC and MC were 97% and 58%, respectively. The 80% and 95% isodose lines covering the ITV and PTV shown in a lung patient study, when calculated with PBC, did not encompass the PTV when recalculated with MC. A similar trend was also found in our study. In the DVHs shown in [Figure 2], the minimum and mean doses to the PTV calculated with PBC (MBPL) were 56.3 Gy and 63.5 Gy, respectively, compared to 43.2 Gy and 53.3 Gy calculated with AAA; for this patient, the minimum and mean doses were overestimated by 30% and 19%, respectively. Also the isodoses from 53 to 63 Gy did not cover the PTV in the AAA calculated plan as shown in [Figure 1]c.
Schuring and Hurkmans  investigated the influence of inhomogeneity corrections on stereotactic treatment plans for NSCLC. They made treatment plans to deliver 60 Gy in three fractions using an equivalent path length (EPL) algorithm (like Batho), and calculated plans with the CCC algorithm. Their EPL plans overestimated the dose to 95% of the PTV, and, in one case, this overestimation was as high as 43%. In addition, their calculated V10 , V20 , and MLD using the CCC algorithm were significantly lower on average by 9.2%, 21.1% and 9.9%, respectively, compared to those using the EPL. In comparison, our V10 , V20 , and MLD were reduced by 5.8%, 10%, and 8.6% on average, respectively, when recalculated with AAA. The results from this study indicate that when creating SBRT treatment plans for lung lesions, the AAA algorithm, a scatter-based dose model with increased accuracy in scattered dose calculation, would be a more appropriate choice. If one decides to use the AAA dose calculation algorithm, the prescribed dose should be adjusted down by 10-14% in order to maintain equivalence to plans generated by the PBC algorithm with MBPL heterogeneity corrections. Our results are in excellent agreement with the recent suggestion by the quality assurance working group of the phase III Rosel study  to reduce prescription dose from 20 Gy per fraction to 18 Gy per fraction in three fractions when utilizing AAA or CCC dose calculation models instead of PBC/MBPL. 1. Timmerman R, McGarry R, Yiannoutsos C, Papiez L, Tudor K, DeLuca J, et al. Excessive toxicity when treating central tumors in a phase II study of stereotactic body radiation therapy for medically inoperable early-stage lung cancer. J Clin Oncol 2006;24:4833-9. 2. Timmerman R, Kavanagh B, Chinsoo Cho L, Papiez L, Xing L. Stereotactic body radiation therapy in multiple organ sites. J Clin Oncol 2007;25:947-52. 3. Carrasco P, Jornet N, Duch MA, Weber L, Ginjaume M, Eudaldo T, et al. Comparison of dose calculation algorithms in phantom with lung equivalent heterogeneities under conditions of lateral disequilibrium. Med Phys 2004;31:2899-911. 4. Papanikolaou N, Battista J, Boyer A, Kappas C, Klein E, Mackie TR, et al. AAPM Report No. 85: Tissue inhomogeneity corrections for megavoltage photon beams: Report of Task Group No. 65 of the Radiation Therapy Committee of the American Association of Physicists in Medicine 2004. 5. Benedict SH, Yenice KM, Followill D, Galvin JM, Hinson W, Kavanagh B, et al. Stereotactic body radiation therapy: The report of AAPM task group 101. Med Phys 2010;37:4078-101. 6. Ulmer W, Harder D. Applications of a triple gaussian pencil beam model for photon beam treatment planning. Med Phys 1996;6:68-74. 7. Sievinen J, Ulmers W, Kaissl W. AAA photon dose calculation model in eclipse. Varian RandD #7170B. Palo Alto, CA: Varian Medical Systems; 2005. 8. Fogliata A, Nicolini G, Vanetti E, Clivio A, Cozzi L. Dosimetric validation of the anisotropic analytical algorithm for photon dose calculation: Fundamental characterization in water. Phys Med Biol 2006;51:1421-38. 9. Sterpin E, Tomsej M, De Smedt B, Reyneart N, Vynckier S. Monte Carlo evaluation of AAA treatment planning algorithm in heterogeneous multilayer phantom and IMRT clinical treatments for an Elekta SL25 linear accelerator. Med Phys 2007;34:1665-77. 10. Cozzi L, Nicolini G, Vanetti E, Clivio A, Glashörster M, Schiefer H, et al. Basic dosimetric verification in water of the anisotropic analytical algorithm for Varian, Elekta and Siemens Linacs. Z Med Phys 2008;18:128-35. 11. Bragg CM, Wingate K, Conway J. Clinical implications of the anisotropic analytical algorithm for IMRT treatment planning and verification. Radiother Oncol 2008;86:276-84. 12. Ronde HS, Hoffmann L. Validation of Varian's AAA algorithm with focus on lung treatments. Acta Oncol 2009;48:209-15. 13. Fotina I, Winkler P, Künzler T, Reiterer J, Simmat I, Georg D. Advanced kernel methods vs Monte Carlo-based dose calculation for high energy photon beams. Radiother Oncol 2009;93:645-53. 14. Kan MW, Cheung JY, Leung LH, Lau BM, Yu PK. The accuracy of dose calculations by anisotropic analytical algorithms for stereotactic radiotherapy in nasopharyngeal carcinoma. Phys Med Biol 2011;56:397-413. 15. American College of Radiology. A phase II trial of stereotactic body radiation therapy (SBRT) in the treatment of patients with medically inoperable stage I/II non-small cell lung cancer. Radiation Therapy Oncology Group, RTOG 0236;2006. Philadelphia, PA: ACR; 2006. 16. de La Fuente Herman T, Vlachaki MT, Herman TS, Hibbits K, Stoner JA, Ahmad S. Stereotactic Body Radiation Therapy (SBRT) and respiratory gating in lung cancer: Dosimetric and radiobiological considerations. J Appl Clin Med Physics 2010;11:158-69. 17. Xiao Y, Papiez L, Paulus R, Timmerman R, Straube WL, Bosch WR, et al. Dosimetric evaluation of heterogeneity corrections for RTOG 0236: Stereotactic body radiation therapy of inoperable stage I/II non-small cell lung cancer. Int J Radiat Oncol Biol Phys 2009;73:1235-42. 18. Fragoso M, Wen N, Kumar S, Liu D, Ryu S, Movsas B, et al. Dosimetric verification and clinical evaluation of a new commercially available Monte Carlo-based dose algorithm for application in Stereotactic Body Radiation Therapy (SBRT) treatment planning. Phys Med Biol 2010;55:4445-64. 19. Schuring D, Hurkmans CW. Developing and evaluating stereotactic lung RT trials: What We should know about the influence of inhomogeneity corrections on dose. Radiat Oncol 2008;3:21. 20. Hurkmans CW, Cuijpers JP, Lagerwaard FJ, Widder J, van der Heide UA, Schuring D, et al. Recommendations for implementing stereotactic radiotherapy in peripheral stage IA non-small lung cancer: Report from the quality assurance working party of the randomised phase III ROSEL study. Radiat Oncol 2009;4:1.